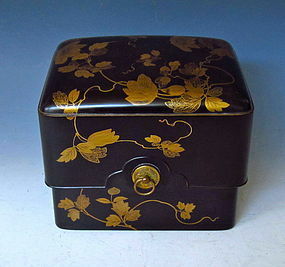 Japanese lacquer box form the Meiji/Taisho period circa 19th century. Decorated with gold flowering clematis vines on dark brown lacquer interior with gold rim inset and shallow tray. Accented with gilt fittings with paulownia decoration and ring handles. Dimensions: 5 1/2'' X 6 1/2'' X 5"
A Chinese landscape painting done on a gold paper base done in the style of Zhang Da Qian. The work contains a signature and seal of Zhang Da Qian's noted disciple Sun Yunsheng (1918-2000). Zhang Da Qian established a style influenced from traditional Chinese landscape paintings combined with Song Dynasty style ink wash landscapes. Work is dated in June of 1975. 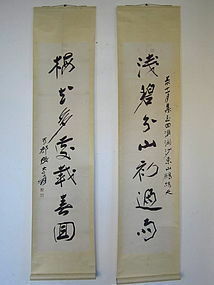 Age: 20th century Size; Length: 64" Height 38.5"
A Chinese couplet scroll in calligraphy excerpting from a work composed by the noted literati scholar, Su Dongpo from the Song Dynasty. Work contains the signature and seal of Zheng Xiaoxu (1860-1938).The two line couplet expresses how as there are different ways to point out the errors in an embroidered robe, or a crane hesitating to fly has yet to mature into an immortal. Age: Early 20th century Size: Height 67.5" Width 16.25"
A Chinese hanging scroll portraying a group of lotuses set in a marsh-like environment with a butterfly flying over the flowers. The work contains a seal and signature of the noted artist, Qi Baishi (1864-1957). Qi Baishi became famous through his independent studies in Chinese painting and his energetic brush strokes and styles evolved Chinese art in the 20th century. 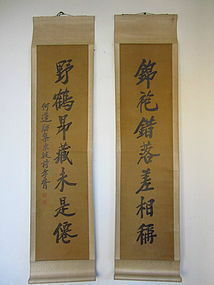 Age: Late 20th century Size: Height 86" Width 23"
A pair of hanging calligraphy scrolls with a couplet verse inscribed signed with the name of the noted Chinese artist, Zhang Da Qian (1899- 1983) known for his traditional landscapes, lotuses, and human figures. The scroll expresses the scenery of the mountains and the plum blossoms in full bloom marking the return of spring. Age: 20th century Size: Length 68.6" Width 15.8"
A two section lacquered kiri tansu done in a design often seen in the Fukushima region. 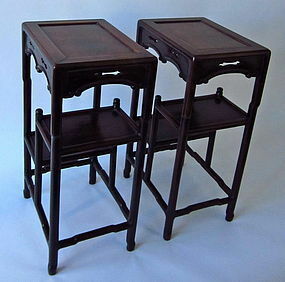 Iron fittings are attached on the sides for easy carrying and to hold the two tansus together. 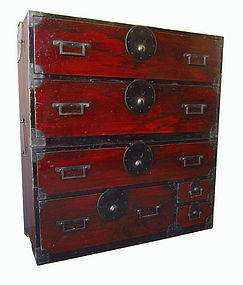 The tansu is made mostly from kiri (paulownia) and sugi (cryptomeria) woods. Age: Meiji Period Size: Length 37.6" Width 16.6" Height 40.5"
A large Kansai area issho tansu made from keyaki and sugi woods. 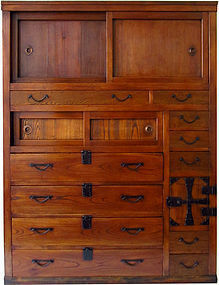 Copper handles are used on the sliding door panels and a special cabinet with a lock is set on the bottom area of the chest. 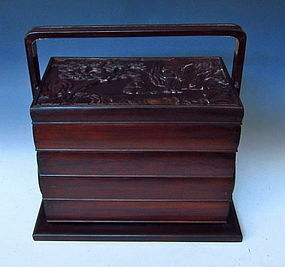 Tansu such as these were often placed in the private quarters of the home and clothes, family documents, and important objects were placed inside. 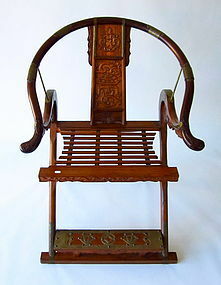 Age: Meiji Period Size: Length 45.75" Width 18.25" Height 60"